Contact Information: Please use the Messages tool in Sakai to contact members of the teaching team. Times and Locations: There are no scheduled lecture or seminar meetings. However, there are weekly online readings and assignments, and you must plan time throughout each week during the academic year to work on these. It is your responsibility to keep up with assignments and stay on schedule. 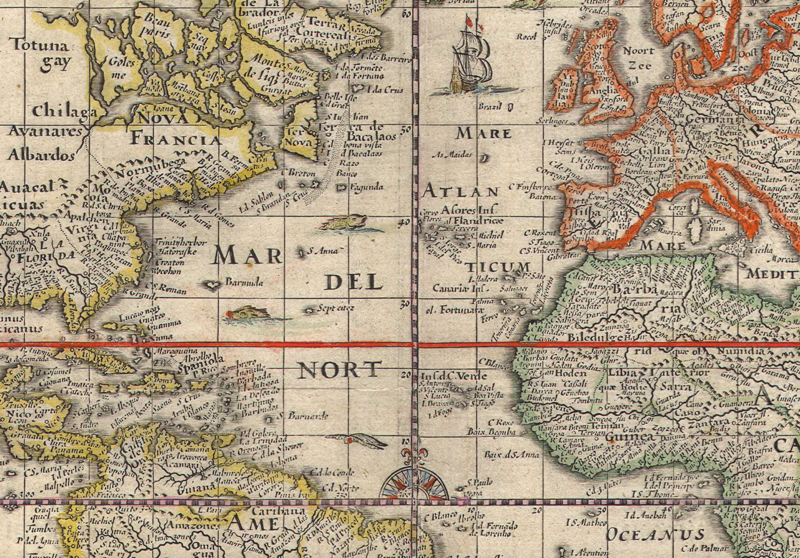 This course explores the practice of history through an examination of the early modern Atlantic World. We will combine an emphasis on traditional historical practices and digital research tools. Take a close look at the image above. Few works of art get at so much history, so simply. William Blake, a radical Romantic artist of the late 18th century, depicts three women in mutual embrace and support, portraying an allegory of human mutuality, particularly the way Africa and America supported Europe. The illustration looks peaceful and idyllic. It is from a book about a British officer’s experience in suppressing a rebellion of African slaves in America. Not much mutuality in that event! But the book’s author, John Stedman, used his experience to speak out against slavery and against the gross exploitation of indigenous Americans. The book, like many of its kind, was not unambiguous (you’ll look at the full picture, and read an excerpt from Stedman’s writing later in the course). Indeed, some historians have commented that the illustration speaks more to the hypocrisies of Europeans in the colonial world than it does to any actions directed at fostering genuine mutuality. But as we'll see the world was not divided into simple good-and-bad, black-and-white characters. Progressive abolitionists could sometimes be misogynistic; conservative anti-democrats could sometimes be forceful critics of empire. In history as in life, contradictions and complications abound. Europe was very clearly “supported” by African labour and American land – that is, we can see that Europe exploited America and Africa. But Blake saw something more. He meant his illustration as an allegory for an imagined future – of what might be, not of what was. Both Blake and Stedman saw clearly that Europe benefited by grossly unequal and decidedly non-mutual relationships. Both were particularly active in the campaign to end the slave trade. Their vision of a mutually supportive Atlantic world economy and society was utopian. The early modern era – roughly 1400-1800 – marks the rise of the West (essentially Western Europe, with the gradual addition of America) in global history. In 1400, Arab, Turkish, and Chinese empires were far more powerful, richer, and technologically advanced than any political force in the West. By 1800, the reverse was true. This course tracks that shift, that series of changes which brought about what we might call “the rise of the West”. That story is complex and even in this full-year course we will only scratch the surface of some of its many facets. But what we will see is that Blake, taken literally, was quite right: Europe was very much supported by Africa and America. Europe’s wealth came through many sources, but the real advances cannot even be imagined without the use of African labour and American land and resources. The Atlantic World (Europe, Africa, and the Americas) was in many ways a unified cultural and economic system, but its major players experienced that system very differently. This course explores that emergent Western dominance, with a keen eye to understanding the very different experiences that shaped it. Each module has between three and six lessons which we'll complete at the rate of one per week. This course operates in two main online locations: in your course e-textbook (where you’re reading this syllabus), and on Sakai. The e-textbook is not a traditional textbook, of course, but it is meant to function in many regards like one. In it you'll find outlines, learning outcomes, and questions for each week, as well as general guidelines for the assignments. There are also links to video introductions and screencasts, as well as links to relevant online information. Your Sakai page is your workbook. The weekly readings and other sources are there, as are the forum where you'll post your comments (like an online seminar), the message app, and the tools you'll use to submit your actual assignments. Detailed instructions will come in due time. These three assignments are closely linked (the material you transcribe will be used in the Voyant Tools assignment, and you'll use those outcomes to conduct your final project). For more details on each assignment, see the Assignments Tool in Sakai. The details for the assignments will be available after the start of the course. Historians (i) contribute to public debates (ii) by making arguments (iii) that answer research questions (iv) using evidence analyzed according to thoughtful methods. The items on this list are examples of what you might consider learning outcomes for your overall university studies in history. Learning outcomes are meant to help the instructors and you gauge your learning and progress. Your work in this course will help you improve your knowledge, professional practice, and skills related to the abilities listed above. More particularly, you should pay attention to the following learning outcomes in your work in HIST 2F90. 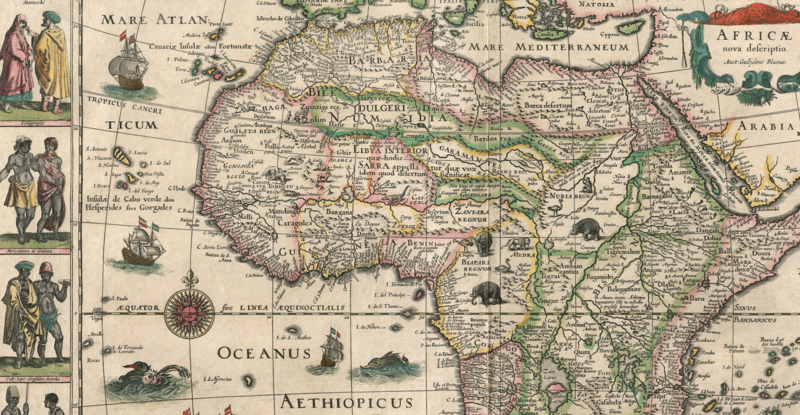 Describe the major developments in the early modern Atlantic world. Communicate ideas/arguments effectively and honestly in all course work. Ask good historical questions and form strong arguments that answer these questions using the best evidence we can find. In addition to this overall set of course learning outcomes, there are also more specific learning outcomes that are listed with each weekly lesson in Sakai. You are NOT required to buy a textbook for this course. All the readings will be provided to you online through Sakai. See each weekly lesson plans for details. Here’s an important note: In 2nd-year history courses it is common to read 40 to 60 pages per week. In this course we will not assign this much in the first few weeks, but we will increase the reading load as the course progresses. See the note about workload expectations that is included in the Introductory Lesson. This course will not work if you are not checking its online resources regularly. This includes checking this online textbook AND the Sakai Messages tool. You should use the Messages tool to write the instructors or other students. You are also welcome to visit the instructors regularly during their office hours on campus. You may also call them by telephone. To arrange a phone discussion, please send an email to arrange a time. Note: Before you ask a question about the course, please make sure you try to answer it yourself by reading the syllabus and other course materials carefully. The instructors reserve the right to ignore frivolous messages. Sakai places you in a group of approximately 10 students. This will be your discussion group for the entire year. Each week, everyone is expected to contribute to the discussion. Remember that you have a limited time to complete your discussion contribution in the week’s “Forum”. If you do not post within the time allotted, you will not get credit for that week. Unless otherwise noted, each week’s Forum will open on Wednesday and close at the very end of the day the following Tuesday. Plan to post early in each Forum so that you and others in your group can develop a rich discussion online. You’ll all learn more this way! You read documents every week in preparation for the discussion group, so be aware of what you need to do to prepare, when you’re expected to comment, and plan your time accordingly. Also plan to read all the previous posts for the week’s Forum before you post anything new. When we grade your work, we’ll expect that you’ve done this. The strongest posts will show evidence that you’ve read the previous discussion for the week. Be sure to post on time so that others have time to read, think and respond. challenge them to provide more examples / take their thoughts further. How long should my posts be? Most posts should be in the range of 150 to 250 words. Sometimes, you may need to say more, others less. But generally, whatever number of words you write, you should be answering one (or more) of our questions, using evidence from that week’s sources, and engaging with your classmates. You are required to post each week. Some weeks have more activities than others, but they are all listed on the module page and in the Course Schedule so you will have plenty of time to prepare yourself for all activities. Hence, your discussion/participation grades will be determined on the basis of not just regular posts in the weekly discussion activities but by creating engaging, thought-provoking commentary and responses to questions that we provide, as well as by initiating new discussion threads that show creative and critical engagement with the topics. 3 - Thoughtful, timely and excellent contributions that stimulate discussion and provide insightful comments with solid grounding in the sources and other students’ comments for the week. 1 - Little or no effort given to posting, and / or the contribution was divergent from the discussion and the readings, and / or the post demonstrated little effort to engage with other students’ ideas. Forum discussions are the heart of this course. Your grades will reflect the regularity and most especially the quality of your weekly contributions. Posts should strive to build conversations – that is, they should engage, and offer thought-provoking commentary and questions for deepening the discussions. New posts should engage with the reading material and posts from other participants, and should always bring out evidence from the readings. The point is to analyze our sources through discussion, and to build and develop the conversation with other students to that end. Failure to participate in Forum discussions will lose you points!! Students are expected to contribute each week to all Forum discussions. Forum discussions are allocated 30 points on your final grade. Failure to contribute to more than TWO weekly forums will be penalized 1.5 out of the 30 points per late or missed week thereafter. Late Forum posts will not be accepted for credit. We will provide you detailed instructions for Forum discussions via Sakai Messages. Friday, January 11, 2019, is the date by which you will be notified of 15% of your course grade. Friday, January 18, 2019, is the last date for withdrawal from the course without academic penalty. The principle of academic integrity, particularly of doing one’s own work, documenting properly (including use of quotation marks, appropriate paraphrasing and referencing/citation), collaborating appropriately, and avoiding misrepresentation, is a core principle in university study. Academic misconduct is a serious offence. Students should consult Section VII, “Academic Misconduct”, in the “Academic Regulations and University Polices” entry in the Undergraduate Calendar, available at http://brocku.ca/webcal to view a fuller description of prohibited actions, and the procedures and penalties. You will submit most of your assignments (Voyant assignment, course project, and take-home exam) through Turnitin.com, a phrase-matching program online. See the assignment details on Sakai for more information. If you have a principled reason for objecting to uploading your assignments to Turnitin.com, please notify the instructors before the end of Week 4 to discuss alternative ways to submit your assignments. Alternatives will include some mechanism for you to demonstrate your adherence to the principles of academic integrity. As part of Brock University's commitment to a respectful work and learning environment, the University will make every reasonable effort to accommodate all members of the university community with disabilities. If you require academic accommodations related to a documented disability to participate in this course, you are encouraged to contact Services for Students with Disabilities in the Student Development Centre (4th floor Schmon Tower, ex. 3240). You are also encouraged to discuss any accommodations with the instructor well in advance of due dates and scheduled assessments. Brock University acknowledges the pluralistic nature of the undergraduate and graduate communities such that accommodations will be made for students who, by reason of religious obligation, must miss an examination, test, assignment deadline, laboratory or other compulsory academic event. Students requesting academic accommodation on the basis of religious obligation should make a formal, written request to their instructors for alternative dates and/or means of satisfying requirements. The University requires that a student be medically examined in Health Services, or by an off- campus physician prior to an absence due to medical reasons from an exam, lab, test, quiz, seminar, assignment, etc. The Medical Certificate can be found at: https://brocku.ca/registrar/wp-content/uploads/sites/45/Medical-Certificate.pdf. See the course home page (aka, the Course at a Glance) for schedule details.